Recently, there has been a welcome upsurge in the number of marine parks around the world. But, along with their creation comes the question, how well do they function? Scientists have been working to answer this through research into park management systems. Now, a new study reveals that we may have been overlooking one of the most important reasons parks fail or succeed. Marine parks often have several different types of management zone. These are areas within the park where activities like fishing and boating are allowed, and other areas where these kinds of activities are off limits. Each management zone affects marine life in a different way. To find out if different management zones protect marine life in the way we hope they do, takes careful research. 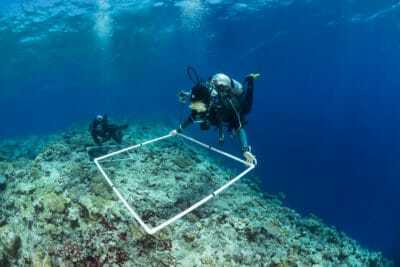 To get a fuller understanding of how marine management zones work, a team of researchers from the Khaled bin Sultan Living Oceans Foundation traveled to the remote locations on the Northern Great Barrier Reef in Australia. The Great Barrier Reef is the world’s largest system of coral reefs, and the park authority that manages it uses a color coding system for management. Blue zones, allow commercial and recreational fishing, green zones, allow boating and snorkeling but not fishing, and pink zones, allow no-entry, they are off limits to all activity. By collecting data from all the zones, the science team could compare how well each of the zones work. Very rich expansive acropora table coral field at the outer edge of the Great Barrier Reef with great visibility. The scientists collected an immense amount of data. The expedition was part of a larger study called the Global Reef Expedition (GRE) which conducted research in 15 countries. For more than a month the team traveled by ship through the remote, and little studied northern region of the Great Barrier Reef. They collected data on the size, species, and number of fish from 30 reefs, some close to shore and others further from land. They also collected data from the north, central and southern sections of the remote region they were studying. Throughout the GRE, the team collected data on corals, including the species, age and health of coral, as well as information on the structure of the reef and other physical factors such as exposure to waves. Scientists from the Khaled bin Sultan Living Oceans Foundation surveying corals at the outer reef edge of the Great Barrier Reef. Ribbon 7, green zone. The scientists were particularly interested in finding out if the populations of fish were doing better in the areas where fishing was off limits, called no-take zones. They identified over five hundred species of fish. To see the effect of fishing they focused on species that fishermen tend to catch, like snapper and coral trout. A simple comparison of fish populations inside and outside a no-take zone could give an answer. But, the scientists wanted to dive deeper in to the massive amount of data. They used statistics that allowed them to compare several possible influences at once. They compared the zones to each other, and also to their location within the park. The team expected to see a big difference between fishing zones and no-take zones in the south as the southern region has a higher population of fishermen. They expected that it would be harder to see the benefit of the no-take zones in the north, because fewer people fished in such a remote region anyway. But, surprisingly, the data revealed the exact opposite, the team had found evidence that the no-take zones were working better in the area that was less heavily fished. The unexpected result could mean several things, but the most worrying was poaching. The team’s data suggested that because there is so much fishing in the south, fishermen may be stealing fish from inside the no-take zones. This would explain why the difference between the no-take zones and the fishing zones was much less pronounced. And the opposite would hold true in the north. Because there is not a great deal of fishing in the zones where fishing is allowed, there are still plenty of fish to catch. Fishermen wouldn’t be inclined to steal fish from within the no-take zones, making the difference between the no-take zones and the fishing zones more noticeable. In fact, the study showed that overall the fished areas in the north contained more fish than the no-take zones in the south. The anomaly highlights that testing the effectiveness of management zones can get quite complicated. To untangle exactly which part of a management plan, or some other factor, is having the most impact, scientists must examine multiple influences on the reef. For example, once a no-take zone has been created some species of fish take longer to recover than others. Coral trout on the Great Barrier Reef can grow in number in just two years, but parrot fish on reefs in Kenya need close to ten years to recover. This means that the age of a no-take zone is important. So too, is the species of fish researchers test. Scientists must carefully choose what they measure. 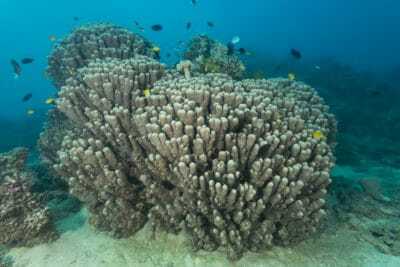 A colony of column like corals (Pavona spp ) in the Great Barrier Reef. The science team from the Khaled bin Sultan Living Oceans Foundation, in collaboration with scientists from the University of Queensland, measured what’s called the biomass of fish, that’s the mass of all the fish combined. Working in the fishing zones, they calculated the biomass of the species of fish that fishermen caught. They found that the biomass went down close to the boundary of large no-take zones. We use no-take zones to help protect and restore habitat and fish stocks. One of the ways they are supposed to work is that as a fish population expands and numbers go up, fish will spill out of the reserve and into fishable areas, providing more fish for everyone. The scientists’ findings of lower biomass of fish close to the no-take zone means that fishermen were ‘fishing the line’, in other words they were fishing reefs close to the border of the large no-take zones more heavily than other sections of the fishable area. This has large implications for fish moving out of the no-take zone and their potential to increase the population of fish throughout the fishable area. However, it also means that fishermen benefit from the no-take zones as they see value in fishing along their edges. The scientists found that evidence of ‘fishing the line’ was even greater around large no-take zones. 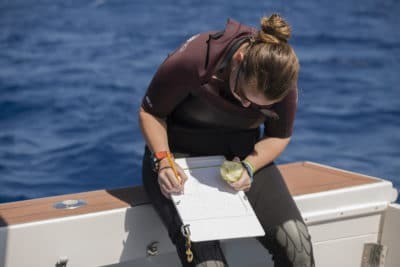 Alex Dempsey, Coral Reef Ecologist for the Khaled bin Sultan Living Oceans Foundation writing down her data. The scientists found clear evidence that management zones worked. But, that wasn’t the whole picture. In fact, by comparing the data in multiple ways they found that there was a more important influencer on fish populations than type of management zone. The scientists compared what they found on the sea floor with the fish life swimming above it. Some of the no-take zones contained healthy coral reefs and some didn’t. The results showed that the health of the reef and the structure, created by branching corals, were the strongest indicators of a healthy fish population, regardless of the type of management zone. In the remote northern reefs far out from shore, the scientists found the no-take zones had no impact on the numbers of fish. In fact, there were more fish in the fished areas than the no-take zones. 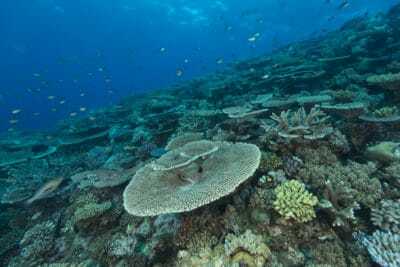 This was because the fished zones were home to healthy reefs covered with branching corals. 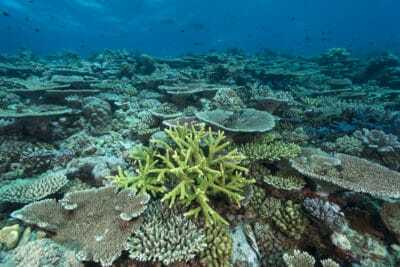 Branching corals are like a forest, they provide shelter, homes and food for an enormous variety of life on the reef. Similarly, in the no-take zones that the scientists surveyed closer to shore it first appeared as if the management zones were protecting the fish. The team found five times as many coral trout in the no-takes zones, compared to the fished areas. 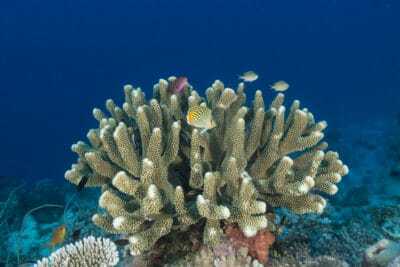 However, when the scientists analyzed the figures in a more complex way, taking account of the coral habitat below, the connection between healthy reefs and healthy fish became more apparent. 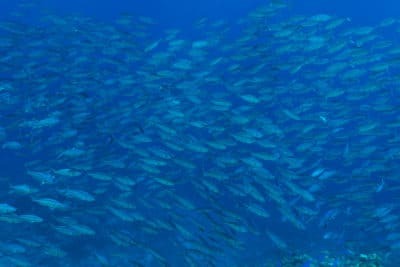 The final results showed that the no-take zones were not causing the healthy fish population, and that the population of fish in the no-take zones was dependent on the health and structure of the reef. 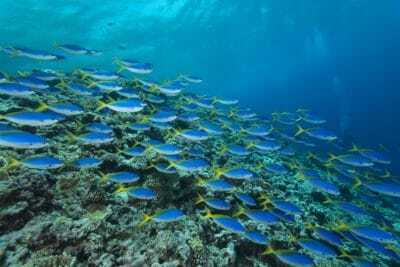 Areas with a lot of branching coral that provided shelter, and a place to live, had a higher biomass of fish. This held true for blue, green, and pink management zones in the north, central, and south of the area the scientists surveyed. More succinctly, reef fish need reefs, and without them, the type of management zone has little impact. There have been very few studies that examine how the habitat of marine management zones plays into their success, especially in remote areas such as the Northern Great Barrier Reef. This is important because marine reserves can offset damage from fishing, but they often can’t protect against things like coral bleaching or cyclones, or in some instances pollution. In 2008, coral bleaching in the central region of the Great Barrier Reef killed a lot of coral, following this the number of coral trout plummeted. Coral and fish are linked. The results of the Khaled bin Sultan Living Oceans Foundation’s research prove that we need to take many factors into account when examining whether marine reserves are a success or failure. And, perhaps even more so when we set up new marine protected areas.